Stay dry and refreshed as you practice for your next big match whilst also standing out to grab your manager's attention with the Dry Squad Football Training Shorts in Seaweed, Hasta and Volt made by Nike. 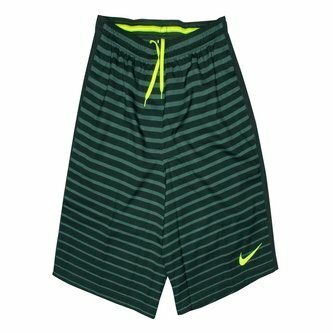 These eyecatching men's football training shorts from Nike have an unique striped design and features a ribbed elasticated waistline with interior drawstrings for a secure and comfortable fit. Zipped mesh side pockets allows you to securely hold onto your essentials as you train. Made from a lightweight polyester material, these shorts feature Nike Dri-Fit technology which is designed to help keep the wearer feeling drier and more refreshed as they exercise by wicking sweat away from the skin and quickly drying off. Side mesh panels improves ventilation to help cool you down too.